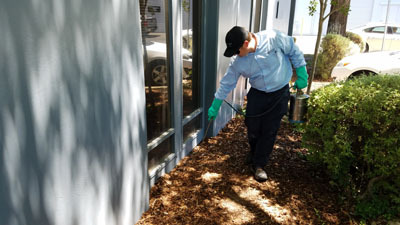 If your home is suffering from an infestation of ants, cockroaches, rats or other unwanted critters, then you need to call the greater Sacramento pest control professionals at Direct Hit Pest Control. For more than 20 years our fully licensed technicians have been providing expert residential and commercial pest control services aimed to rid your property of pests. Our team is skilled at eradicating all types of pests, including ants, beetles, fleas, cockroaches, rats and many more. At Direct Hit Pest Control we are fully focused on prompt professional service. We perform our work in a safe and professional manner with your satisfaction in mind. With valuable experience and ongoing training in the latest products and techniques, our goal is to bring you the results you expect and deserve. At the first sign of a pest problem, call Direct Hit Pest Control and let us get rid of what's bugging you! 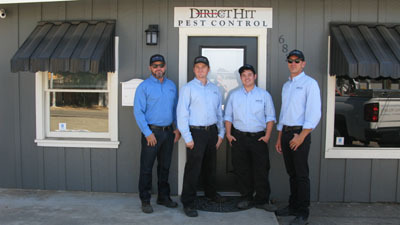 Direct Hit Pest control is a family owned business staffed by a team with more than 30 years of experience. Our entire crew of licensed technicians undergo regular training to ensure we stay up to date with the latest pest management techniques. As a local business, we strive to ensure that our friends, neighbors and other clients in the community have a great customer service experience and are 100 percent satisfied with our services. As an Integrated Pest Management company you can count on Direct Hit Pest Control to handle your pest problem in the most effective way possible. We will listen to your chief complaint and then conduct a thorough assessment of the situation. Our techs will consider a number of factors when deciding the best course of action, including the target pest, environment, sanitation, access and exclusion, to ensure we get the job done right the first time. To request a free estimate for pest control in The Greater Sacramento Area including Rio Linda, Natomas, Roseville, Antelope, Carmichael, Citrus Heights, and more.. Call us at (916) 992-6870. We recommend only necessary and appropriate services that are designed to eliminate pest issues and to provide you with peace of mind. "One of my first calls after moving in a new house is to a pest control company. Direct Hit has been an excellent company to work with. Always reliable, friendly, and effective! If I ever have an issue with new pests, they are right on it. I highly recommend them!" "These guys are great. Friendly, reliable and call before they come for my tri-monthly spray for pests. AND, they clean away the cobwebs." "Excellent company... I manage an apartment complex in Sacramento and I've used Direct Hit Pest Control for many years. They listen to your concerns and always take care of any pest problems that I may have. I highly recommend this company." "Great service every time! Very nice people to work with. Always taking care of our spider problem."